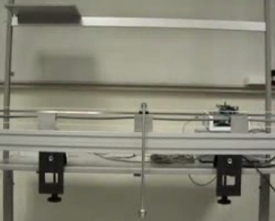 At SUPSI (Scuola Universitaria Professionale della Svizzera Italiana), Lugano, Switzerland, an Inverted Pendulum was controlled using FLEX board with Scilab/Scicos. The FLEX Base Board and the FLEX Multibus Board with a FLEX Multibus CAN Module was used for swinging-up and maintaining the inverted equilibrium. The Source code was entirely generated using Scilab/Scicos , an automatic code generator for control systems.